What follows is an excerpt from a recent interview with Liz on the Lesley University web page. Liz received her M.Ed. degree in 2009 from Lesley’s master’s program in Creative Arts in Learning. 1 In early childhood, use songs and finger plays to encourage learning about rhyming, letter sounds, narrative, sequences and counting. I encourage early childhood teachers to consider my literacy songs. My Songs for Rhyming and Reading are especially great for pre-K and Kindergarten. 2 It almost goes without saying, but songs are indispensable for memorizing facts. Many people mention that they learned those fifty nifty United States through Schoolhouse Rock. And I’ll bet nearly all of us learned our alphabet through the ABC song. Songs could also help students learn skip counting, multiplication tables and many other handy facts. 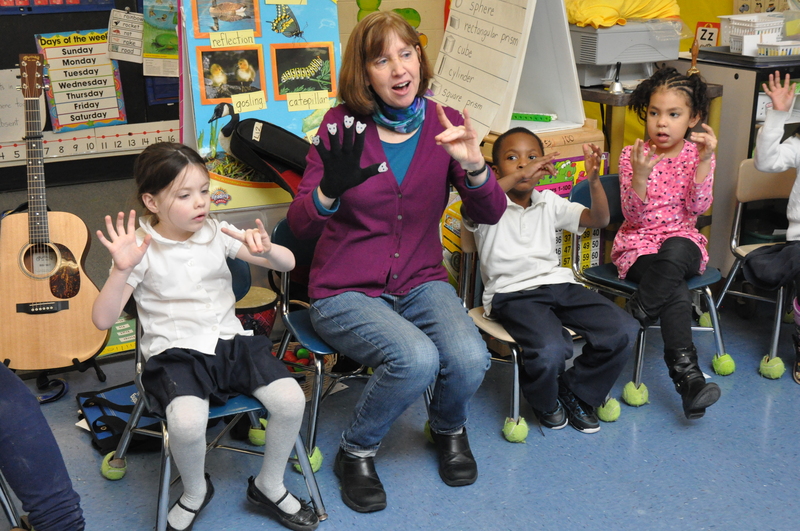 3 Learning about music can raise students’ awareness of distinctive sounds, which is important in learning to read and write, and for English Language Learners, to achieve fluency. Playing instruments and distinguishing different musical tones, pitches and timbres builds aural skills. Students can create soundscapes and act out stories with instruments representing different characters. Such activities add a new, deeper dimension to the learning experience. 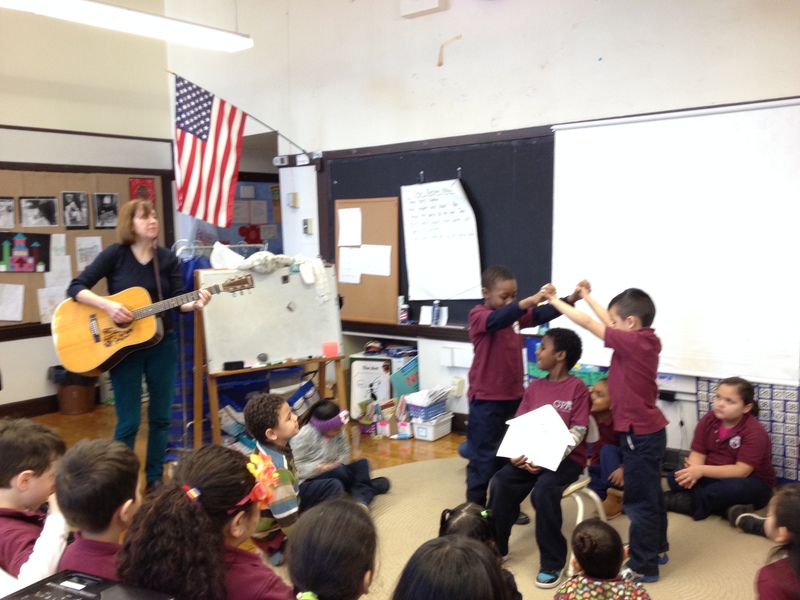 Students at the Gardner Pilot Academy act out my musical version of The Three Little Pigs (which was written at the Gardner several years ago). 4 Music is also a good tool for learning in science and social studies. I’ve had great success having students dance the life cycle of a butterfly and the growth of a seed into a flower or tree. In social studies, I’ve had children learn spiritual songs as part of units on the Underground Railroad and the Civil Rights Movement. Songs from other cultures, and in other languages, are an important part of learning about cultures from around the world. 5 Music should be an essential part of school culture. One of my earliest memories of school was the assembly that took place every Friday at the school where I attended first and second grade. Each assembly featured a play put on by one of the classes, and always began with an all-school sing. I don’t remember much about my classroom experiences at that school, but I remember the words to every single song we sang. At the school where I teach now, we have an all-school Songfest to end the day every Friday. Our children get so excited, anticipating that time of singing as a group. Songs inspire, motivate and pull people together as a community. What better way to encourage children to love school and feel a part of something bigger than themselves?